House Speaker Joe Aresimowicz, flanked by Bob Duff and Matt Ritter, the Senate and House majority leaders, and Senate President Pro Tem Martin Looney. House and Senate Democrats topped their legislative agenda Monday with pledges to adopt paid family and medical leave and a $15-per-hour state minimum wage. And while House Speaker Joe Aresimowicz, D-Berlin, insisted his caucus remained open to discussing mandatory school regionalization proposals offered by Senate Democrats, the issue was conspicuously absent from the joint agenda. Democrats, who hold majorities in both chambers, also pledged joint support for more affordable prescription drugs, greater investment in manufacturing job training and clean energy initiatives, and a state constitutional amendment to permit early voting. Workers would be guaranteed up to 12 weeks per year of paid leave to care for an ill family member, and could not be dismissed for taking leave. The benefit would be equal to 100 percent of their pay — up to a maximum of $1,000 per week. Paid family and medical leave would be financed exclusively through a new payroll deduction on all workers in Connecticut, said Rep. Robyn Porter, D-New Haven, co-chairwoman of the Labor and Public Employees Committee. Though details still are being negotiated, Porter estimated workers would be charged one-half of 1 percent of their pay to fund the family and medical leave system. The benefit would not be available to workers for the first year after enactment, Porter added, to allow the state to amass sufficient funds to cover benefits. Critics have argued paid family and medical leave will prove too inflexible for many businesses, who cannot afford to leave a post vacant for 12 weeks. The other linchpin of the Democrats’ joint agenda is a gradual increase in the state’s $10.10-per-hour minimum wage up to $15 per hour. It is not clear how long the phase-in period would be. Gov. Ned Lamont, who campaigned on many of these issues, offered an early endorsement of his fellow Democrats’ agenda. 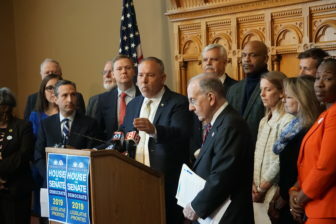 “These legislative proposals will build a stronger, more prosperous Connecticut for the middle class and our families,” said Senate Majority Leader Bob Duff, D-Norwalk. But Republican legislative leaders argued some key elements of the Democrats’ agenda would do just the opposite. Perillo and others have questioned whether raising the minimum wage, establishing paid family and medical leave, and other ideas under consideration — such as establishing tolls — would have a cumulative, chilling effect on Connecticut’s business climate. Absent from the joint agenda were two proposals offered by Senate Democratic leaders to mandate regionalization of small school districts. One bill, introduced by Looney, would require communities with populations of less than 40,000 to consolidate with another school district. A second measure, offered by Duff and by Sen. Cathy Osten, D-Sprague, would direct any district with fewer than 2,000 students to merge with at least one more so that the expanded district’s student population exceeds 2,000. If a community did not wish to do so, it would have to explain its hardship in writing to the state Department of Education. Aresimowicz thanked Looney and his colleagues for sparking debate about this issue and said House Democrats remain open to discussing the topic, even if there is no consensus on it now.